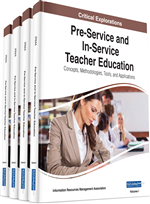 The purpose of this chapter is to further understand how preservice teachers critically think about technology and their competence in technology integration. A mixed methods research design was employed to gather survey and performance task reflection data from preservice teachers. Data were analyzed using a categorization process based on preservice teachers' conceptualizations of technology as replacement, amplification, and transformation. Results revealed a significant overall effect of the selection of performance task upon whether it was applied in a transformative manner, but that no such overall effect existed for amplification and replacement. Descriptive analyses indicate preservice teachers were self-reflective about the extent to which technology influences students' learning. Conclusions indicate that teacher education programs should consider how they support preservice teachers to become self-reflective consumers of technology. The influx of technology in the educational system has brought about changes in instructional methods as technology is integrated across content areas and grade levels. Technology integration is described as a sustainable change in the social structure of the K-12 educational system resulting from the adoption of technology as a means to assist students with constructing knowledge (Belland, 2009). Proponents of technology integration argue that a defining characteristic is a student-centered classroom where students operate and manipulate technology (Hammonds, Matherson, Wilson, & Wright, 2013; Lowther, Inan, Strahl, & Ross, 2008). Lowther et al. (2008) studied the use of computers to increase learning and impact student achievement as well as teachers’ abilities and perceptions toward technology integration. Findings indicated that students in classrooms where teachers had received professional development on technology integration were more engaged in student-centered activities and independent inquiry and used technology as a meaningful learning tool. Likewise, teachers participating in the professional development experience reported increased positive attitudes toward technology integration and were more confident in incorporating computer tasks in their teaching. Additionally, teachers improved their skills with technology and were better equipped to integrate technology to help students learn standards, thus supporting the notion of multiple increased benefits and outcomes for the effective implementation of professional development focused on technology integration.